If you want to work with us on a project involving event portrait photography, you have come to the right place! If you have a different project in mind click here to see our other services. Having us take photos at your event is fully unique. Yes, we make incredible photographs. But it's the experience that makes people rave about us. 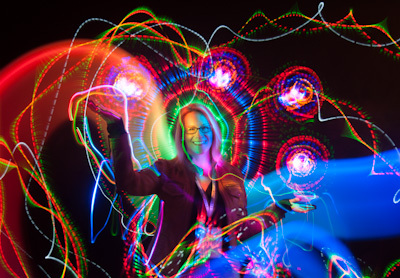 We are a star attraction at any event where we create light painting photographs. We help make the event spectacular. Your guests will be blown away by how fun and interesting the experience is and how fantastic the results are. Our subjects often feel as though they've discovered something new and magical. The ideas and the images are created as collaborations between the people and Julian. 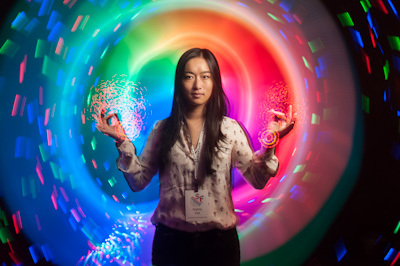 After the event is over, people often change their Facebook profile pictures to a light painted portrait of themselves. We take it as such a compliment and it's fun then seeing the great comments those pictures get. People LOVE this! How are Light Painting Portraits created? The difference is that Julian gets so many fabulous images and does his work so fast! How do you choose the topics for the photos? This is typically done in collaboration between us and the person being photographed. For some examples of what people asked for and the photos they ended up with, click here. Will there be a good photo of everybody? We aim for that - there is at least one great photo of 98% of the people who get photographed. For example, at the SF Music Summit, 63 people were photographed and all got at least one great photo of themselves. In our philosophy, the person looking good in their photo is far more important than the light painting aspect. How long does a session take? About 6 minutes. Sometimes longer. Sometimes shorter. At the SF Music Summit, 63 people were photographed in a bit under a 7 hours period, with julian taking one 15 minute break. This works out to about 6 minutes a person. What is needed to do a shoot? 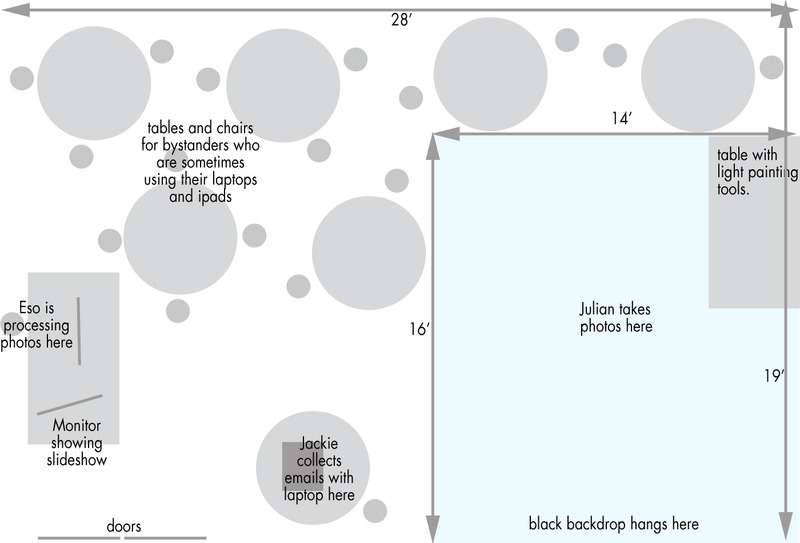 How big does the Room or Space need to be? Good light painting portraits can be taken in a room that’s just 13’ by 15’. That is our recommended size. If the room is especially large, people can come inside and enjoy watching the process of light painting before they are painted themselves. This is always a crowd pleaser! How dark does the Room or Space need to be? In order to do light painting portraits,we'll need to either have a naturally darkened room, or make a room dark inside. Here are ways we have achieved this in the past. An interior room with a door: We prefer a dedicated room whenever possible, a windowless room is best. The room that nobody wants because it has no natural light is a perfect spot for us! If there are windows, we may cover the windows with black fabric and possibly gaffers tape. There are added benefits in a large room: People very much enjoy watching the process of light painting before they are light painted themselves. It gives them time to think of a cool idea that they want for their photo, and it entertains them if there is any line. More space is also a benefit for creating great images. At The SF Music Tech Summit, the room we used was great and was 28' by 18'. The space was literally full of an entranced audience, who watched us work long after their turn was over. They chatted quietly and seemed to refresh from the hectic convention atmosphere. The room we shot in at OSCON Tech Convention was even larger, and people took their laptops in to work on their OSCON projects as they watched us. 10’ by 10’ EZ-UP: Some advanced notice is needed, but we can use a 10’ by 10’ EZ-UP structure. It’s about 10’ tall at its highest point. It is covered on all 4 walls and on the roof by blackout fabric. Inside, it's dark enough for light painting portraits. This structure can be used either outside at night or inside at any time (given tall ceilings). For an outside event in daylight we would need a thicker cover customized for your event, one benefit is that the exterior could better match the esthetic of your event. For example, a wedding theme with flowing white draperies and floral touches. An interior or night setting would not need a special cover. A rental truck: We have done light painting portraits at events such as The Treasure Island Music Festival with a rental truck. The inside of the truck is naturally quite dark. For esthetics the sides of the truck could be fully draped with decorative fabric or your custom signage. Pipe and drape: At the Academy of Sciences in San Francisco, we used “pipe and drape” from the floor to the ceiling to make a dark environment in order to do light painting portraits at a wedding. This is a clumsy way to do things. How small can the space be? Bigger is better, but for one wedding the only option was to make a pipe and drape dark environment in a club which was 7’ wide and 11’ long. In that space, Julian did both light painting portraits and white background studio pictures. It's possible, but its quite cramped for everyone, and is not a recommended or ideal setup. A slideshow of images at the Event: After a person is photographed, the images of them are displayed in a slideshow which is projected or shown on a screen. At a Microsoft event, shortly after the photos were taken, they were projected on the walls of the event space which had seamless projection across several walls. This can be seen a short ways into the video on this page. If we're doing a sideshow, we should think of the best place for the monitor or projector to go which is displaying the images. Images posted live: If desired, we can post the images on Facebook, twitter, or any other desired social media site shortly after the images are created. Every image, offered full res to the participant: At the SF Music Summit, our employers wanted the musicians who were photographed to be able to use their images for self-promotion of any type. Everyone photographed was given a link to the full resolution images (with no watermark) and told that they could use the images of themselves however they wished. Tip jar: Grateful participants have asked often enough that we have a tip jar. Tips are considered ours, we dont ask for anything, and we are always gracious to all. A DVD of the images: We offer a DVD of all of the full res images from the event., on request. We email everybody their photo: At the event, we take the time to collect e-mail addresses from all participants. After the event is over, we e-mail everybody with the link to their images. We have never used these emails to spam anyone and we will not do so in future. We are quite fair and honest. Let us know the type of event/client, the length, the approximate date, and the city it's in. If you have thoughts on which option we should use for making a dark room, that would help determine our quote - the easier it is for us, the easier it is for you. If you do or do not prefer the live slideshow of the images at your event please say so.